A sea turtle rescue center in North Carolina cares for and rehabilitates injured sea turtles, and returns them to the ocean amid cheering crowds. Sea turtles are resilient, but they are slow to recover. So the Karen Beasley Sea Turtle Rescue and Rehabilitation Center spends a lot of time and effort to help save loggerhead and other Atlantic Ocean turtles. Read more about the rescue center and sea turtle release. 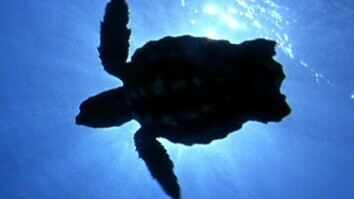 Sea turtles are the canaries of the ocean. If this ancient creature who has existed since before the age of the dinosaurs, who survived all the cataclysmic events that reshaped the planet. If they are in trouble, we are in bigger trouble. How the sea turtle hospital came to be. Well, we didn't do it, a turtle did. One little tank in a volunteer's backyard was the start of the sea turtle hospital. Very few hatchling turtles survive to adulthood. Most of the estimates are somewhere between 1 in a 1000 and 1 in 10,000 but historically, those turtles that did survive to adulthood were able to live for a number of years and produce many, many offspring. What turtle hospitals do is take some of those older individuals. that would otherwise be lost, and return them so that they can fulfill their natural function of replenishing the population. Turtles are profoundly affected by pollutants, in particular, plastic debris. 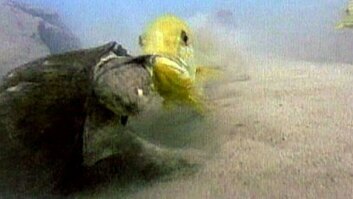 Loggerhead seem to be programmed genetically to bite anything that is floating in the ocean. Before the ocean was littered with debris, that was a very good strategy for survival. I see plastics constantly in this hospital. A balloon floating on the water looks like a nice tasty jellyfish to them and they're going to eat it. You get enough of those inside and they're going to clog up the intestinal track and it may die. Injuries are very diverse. We do get things like shark bites, prop cuts, turtles caught on hook and line, we have the net fishing. The turtles get entangled in the net. Somewhere around 90% of our turtles survive. Which is an incredible thing for rehab. Every turtle that we release takes away a piece of all of our hearts. It's a wonder anything's left with going over 400 with this latest release but it is very important to put a creature of the sea back in the sea, because with all the dangers involved, that is where they belong and I had to reconcile myself to the fact that we might spend years and a lot of time and energy and effort and love getting that animal ready to go back home, and it might not last past the first wave. I had to struggle with that and then I knew, that to be a real sea turtle again, even if it's only for minutes, or a day, of a week or a year, is what it's all about. You feel that surge of exuberance from the turtle that is pushing away from you, you that have cared about it for so long, and it's gone.